Face the infamous Afrika Korps of World War 2 in this award-winning third-person shooter. You are the turning point. Because one bullet can change history... Sniper Elite 3 is a tactical World War 2 third-person shooter with stealth gameplay, authentic ballistics and huge open levels. 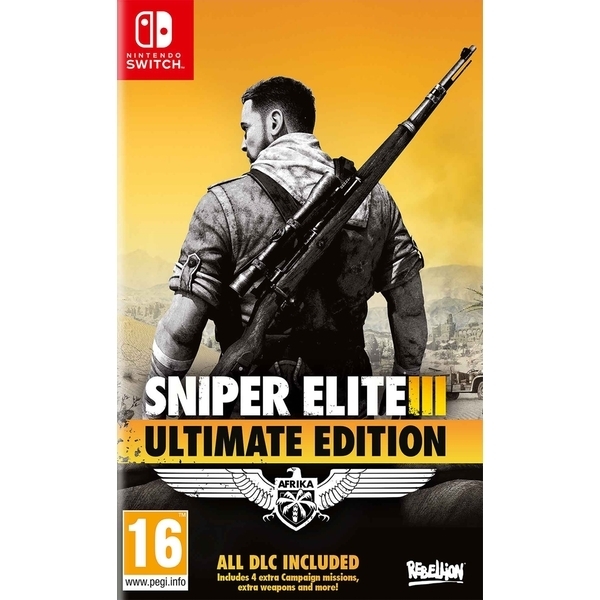 I have to say, I find the cover art for Sniper Elite 3 Ultimate Edition to be pretty fancy! While the behind-the-back character shot isn't anything new, the use of limited color here really makes the cover stand out. If I was walking by store shelves filled with games, I definitely think this box would catch my eye.